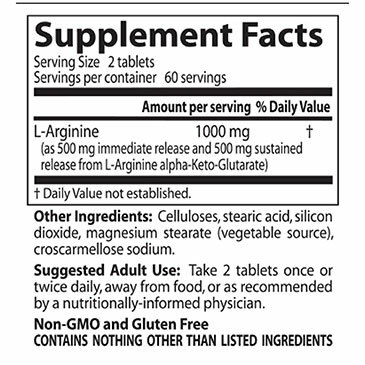 Sustained plus Immediate Release L-Arginine contains this conditionally essential amino acid in a bilayer tablet, with two tablets providing 500 mg of sustained release and 500 mg of immediate release L-arginine in a formula that allows for enhanced blood levels of this nutrient. These tablets are specifically manufactured to immediately increase blood levels of L-arginine and then to sustain this beneficial increase continuously over an 8-hour period. 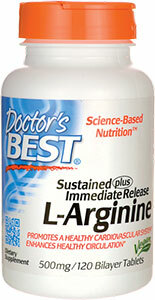 L-arginine has been shown to support the cardiovascular system, promote vigorous heart function, healthy blood pressure and enhance healthy circulation throughout the body through its conversion to nitric oxide. Suggested Adult Use: Take 2 tablets daily, away from food, or as directed by a nutritionally informed physician.